More than ever before, people are traveling with their dogs – and not just to the great outdoors, but to hotels and restaurants and shops and tasting rooms. There are plenty of places in the Napa Valley that are dog-friendly, but it helps to know which ones they are. There’s nothing worse than finding out that Fido is forbidden when you show up for your reservation. Needless to say, pooches are only appropriate for venues with outdoor dining areas, which means that spring and summer are ideal times to bring your pup along. Here’s a list of the Napa Valley restaurants with a reputation for rolling out the welcome mat for your canine companion. Fumé Bistro and Bar, Napa. Along with its excellent wood-fired pizzas, grilled meats, and other comfort foods, Fumé offers a menu for dogs – including a beef patty, chicken, or eggs – and will bring it to your table in a dog bowl. Angèle Restaurant & Bar, Napa. Perched above the Napa River with all its maritime breezes and wildlife, Angèle’s lovely terrace is perfectly located for canines. Its menu of classic French dishes and gorgeous cocktails are accompanied by friendly wait-staff who will bring a water bowl for your chien. Downtown Joe’s Brewery & Restaurant, Napa. 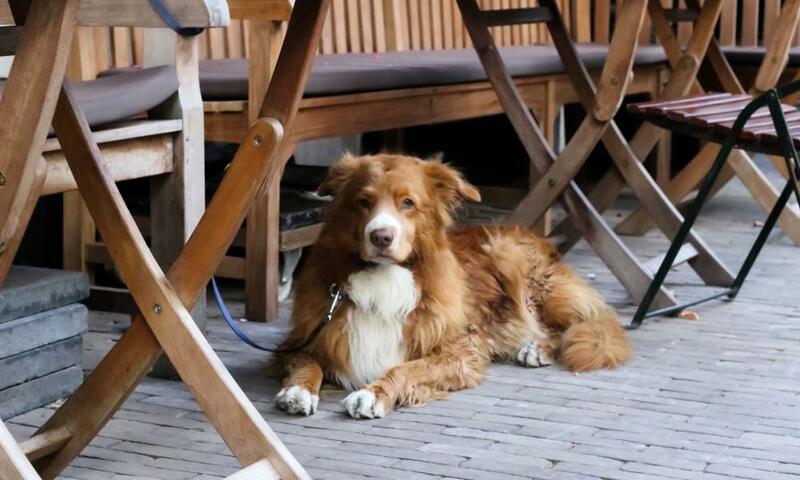 This is the place to come for hearty burgers and pub fare – and lots of love for your quadruped. They’ll bring extra water and, if you’re lucky, even sneak you a free side of French fries. Hurley’s Restaurant, Yountville. The menu here covers everything from Mediterranean and Middle Eastern to down-home American. Whatever you order, you’ll get a large water bowl and plenty of attention for the four-legged member of your party. Lucy at Bardessono, Yountville. Although this venue is a little more formal, its love for dogs is no less. Besides the elegant garden-to-table, American menu of gorgeous seafood and meats, you’ll be offered a water bowl and house-made dog treats. Bouchon Bistro, Yountville. The French love their dogs, which may explain why this classic bistro by Thomas Keller warmly welcomes dogs to its charming outdoor terrace. Whether you choose the Grand Plateau of shellfish or the amazing roast chicken, you’ll feel like you’re sitting in a sidewalk Paris café with your pooch. Solbar, Calistoga. This high-end, farm-to-table restaurant may be a bit pricey, but the service is warm and friendly – to all species. It has a beautiful, arbor-covered terrace with plenty of shade, and there’s even a bocce ball court for a few rounds before or after your meal.